Please note that all weapons shown here and/ or owned by members of this group are legally deactivated or are inert replicas. 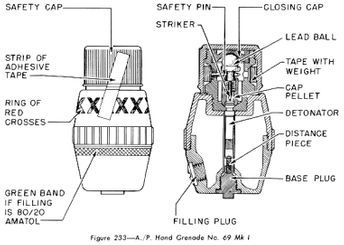 William Mills, a hand grenade designer from Sunderland, patented, developed and manufactured the "Mills bomb" at the Mills Munition Factory in Birmingham, England, in 1915. The Mills bomb underwent numerous modifications and the No. 36M Mk. 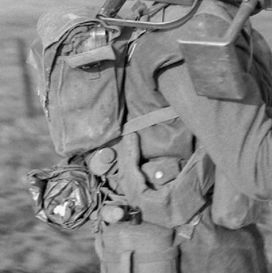 1 was the British army's standard hand-grenade from the 1930s to the 1970s. The Mills was a classic design; a grooved cast iron "pineapple" with a central striker held by a close hand lever and secured with a pin. According to Mills' notes the casing was grooved to make it easier to grip and not as an aid to fragmentation, and in practice it has been demonstrated that it does not shatter along the segmented lines. The Mills was a defensive grenade: after throwing the user had to take cover immediately. A competent thrower could manage 15 yds with reasonable accuracy, with a danger area of about 100 yds. 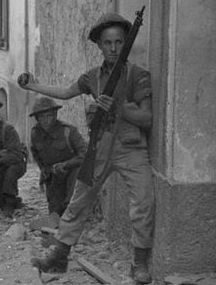 The British No 69 was a hand grenade developed and used during the Second World War. It was adopted into service due to the need for a grenade with smaller destructive radius than the No 36M "Mills bomb". This allowed the thrower to use a grenade even when there was little in the way of defensive cover. 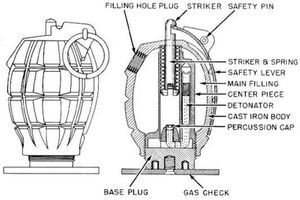 In contrast, the much greater destructive radius of the Mills bomb than its throwing range forced users to choose their throwing point carefully, in order to ensure that they would not be wounded by their own grenade. 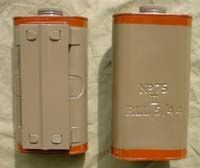 The shell of the No 69 grenade was composed entirely of the hard plastic, Bakelite, which shattered without producing fragments like a metal bodied grenade. The No 69 was the first British device to make use of the 'all-ways fuse', an impact-only fuse. The term "Allways" refers to the fact that all of the possible ways in which the grenade could hit a target were guaranteed to trigger detonation. The fuse was worked by the user first unscrewing a plastic cap to expose a long, narrow cloth streamer with a curved lead weight attached to the end. Upon release from the hand or projector the weighted streamer would catch the air and quickly unwind from the top of the grenade, eventually withdrawing a loose safety pin from the fuse. 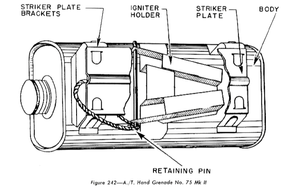 With the pin removed the striker and detonator would be free to come into contact, which would happen due to the force of impact when the grenade struck a hard surface.